If you have known the person that you want to ask for a long time, then try a proposal like this one. Here we have a sign that reads “I’ve waited 4 years to ask you this.. prom?”. This is such a special idea because the number 4 is made up of pictures of them both together. You can recreate this with your own photos or no photos at all as the sign would be nice without them too. Are you or the special person you want to ask fans of superheroes? If so, this idea is for you. Here we have a superhero themed proposal. It is a simple idea but the other person will love it! You can customize it with your favorite superheroes too. Our next prom proposal idea has a Harry Potter theme! 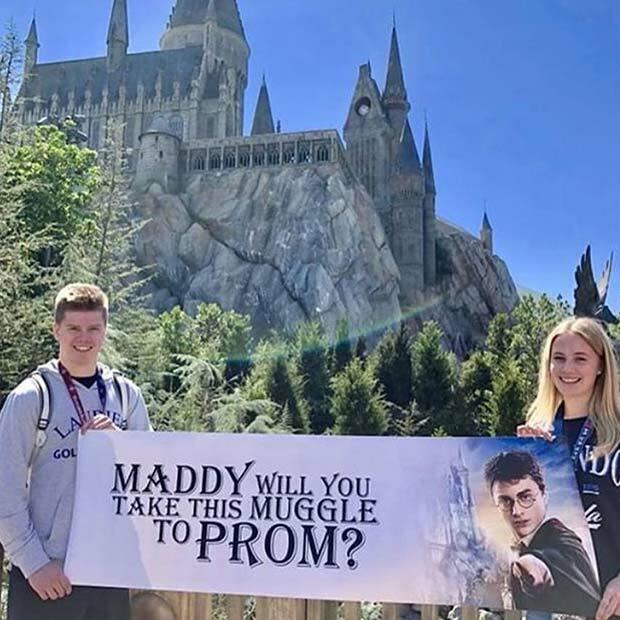 The proposal took place at what looks like The Wizarding World of Harry Potter with a sign that reads “Will you take this muggle to the prom?”. This is such an amazing idea for a Harry Potter fan. You can recreate the whole proposal or just make the muggle sign, it will be just as special wherever you ask the person. Next, we have another cute and unique idea. For this promposal a car was covered in sticky notes with ‘prom?’ wrote on them. 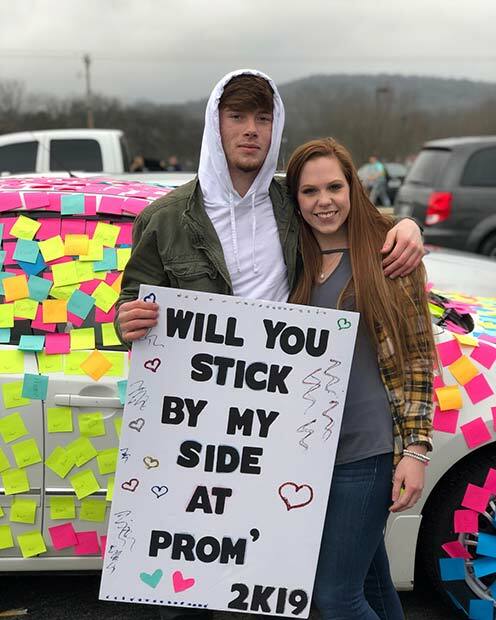 A poster was also made that reads “Will you stick by my side at prom”. It is such a cool idea and it shows you made a lot of effort to. 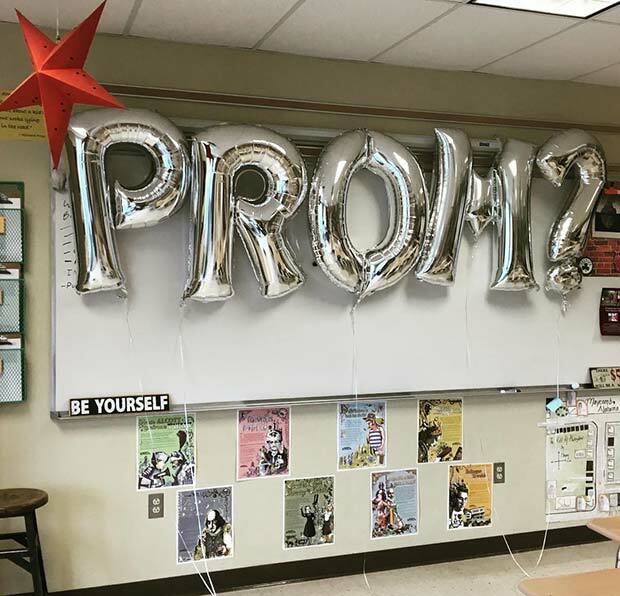 An easy but cute way to ask someone to the prom is with balloons. You could create something like this with giant balloons. For this idea, a room has got large balloon letters that spell out prom. This is a simple idea that anyone being asked will love. You can buy balloons in all colors too. Does the person you want to ask love makeup and beauty? If so, check out this proposal idea. For this one, a sign has been made to look like a highlighter palette. 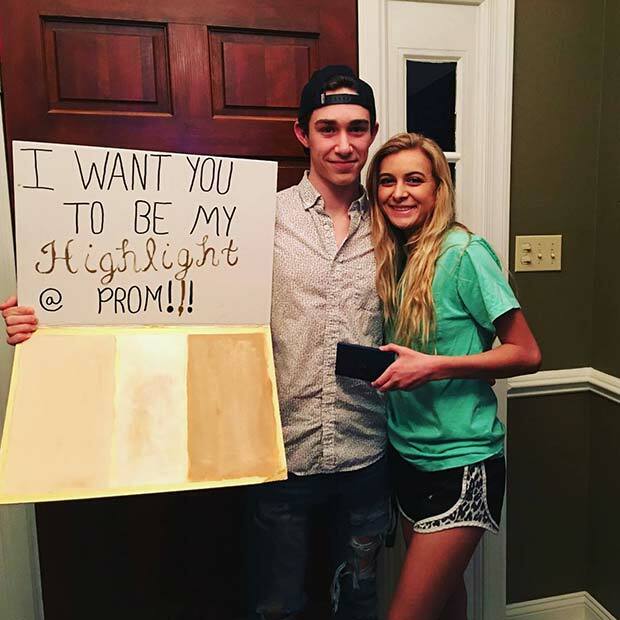 The top of the sign reads “I want you to be my highlight at prom”. This is such a cute and unique idea. We love this one! 18. Will You Be My Sunshine at Prom? The next idea we have to show you is so cute! 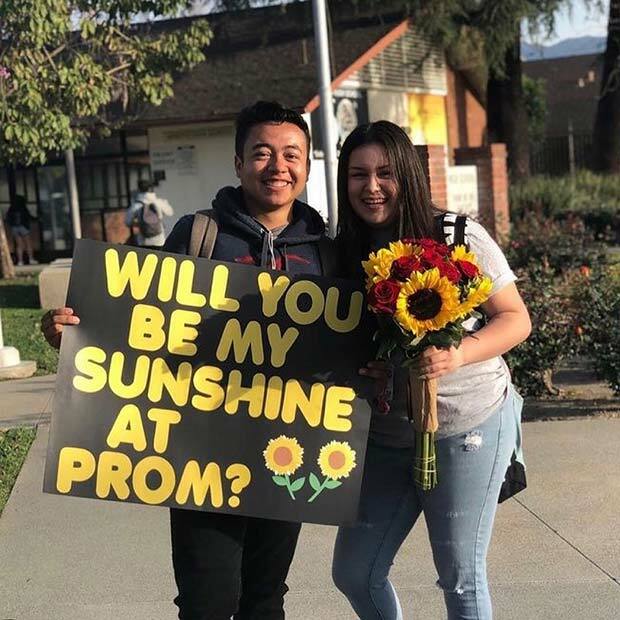 This proposal features a sign that reads “Will you be my sunshine at prom?” with a bouquet of roses and sunflowers. Anyone would love a proposal like this because it is so sweet. It is quite easy to recreate to and you can add other flowers to the bouquet. Our next idea is funny and perfect for anyone who likes having a joke. Here we have a sign that reads “Prom? 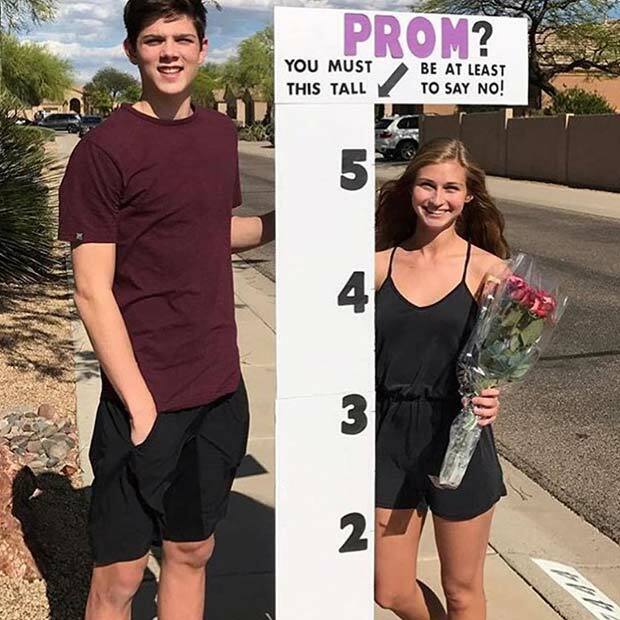 You must be at least this tall to say no!”. The sign has been made to make sure that person is below the height line so they are not tall enough to say no. It is a clever idea that will be remembered. Looking for a simple but sweet idea? Then this is for you. 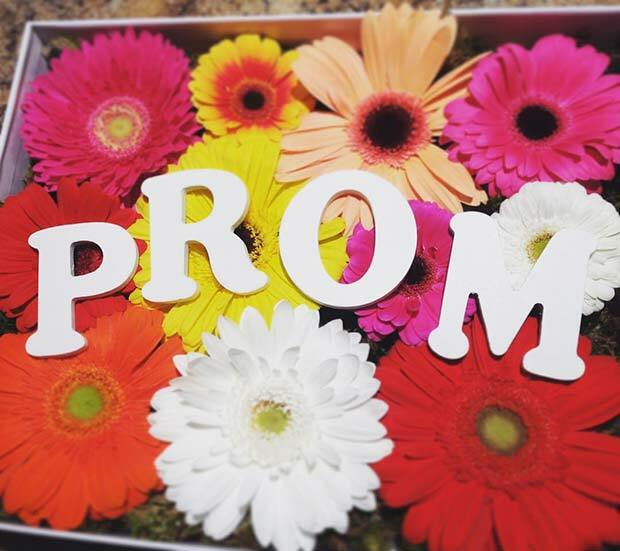 Here we have a beautiful flower arrangement with the word prom added to it. It is a stunning idea and can be made with any flowers. You can choose the person’s favorite flowers or use the language of flowers to send a special message to the recipient. Next, we have another outdoor promposal idea. 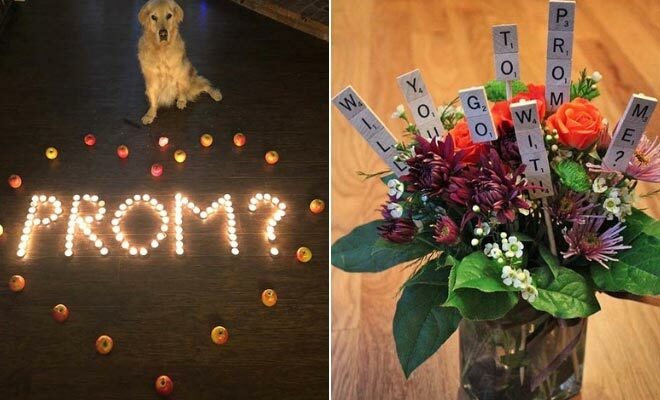 The word prom has been created out of natural things and has been placed on the floor. This would be perfect if you are walking with your special someone as they can be surprised by the sign. 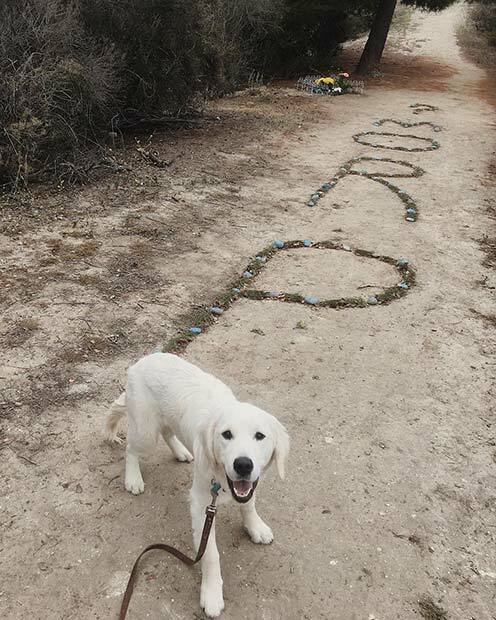 If you have an adorable dog then bring it along too, as you can see the dog makes the proposal super cute. Our next idea is another themed proposal. This one was inspired by the movie Up. 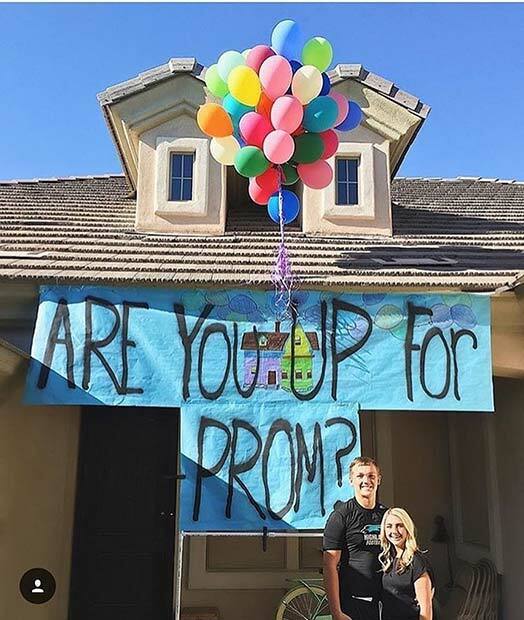 It features balloons with banner that reads “Are you up for prom?”. 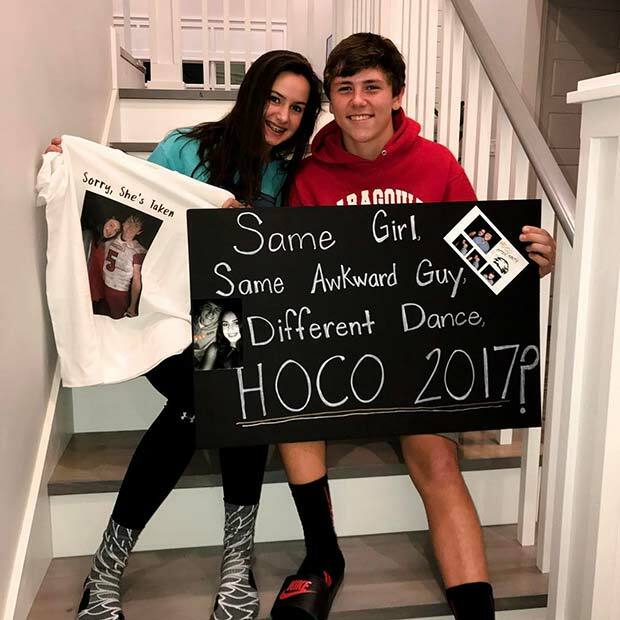 It is such a cute idea and it is perfect for a fan of the movie. 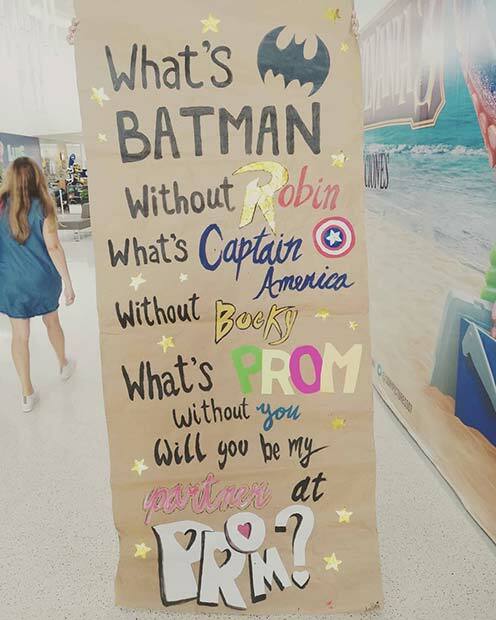 You can create a similar proposal with any movie theme. The last idea on our list is this cute proposal. For this proposal, a T-shirt and sign has been created. 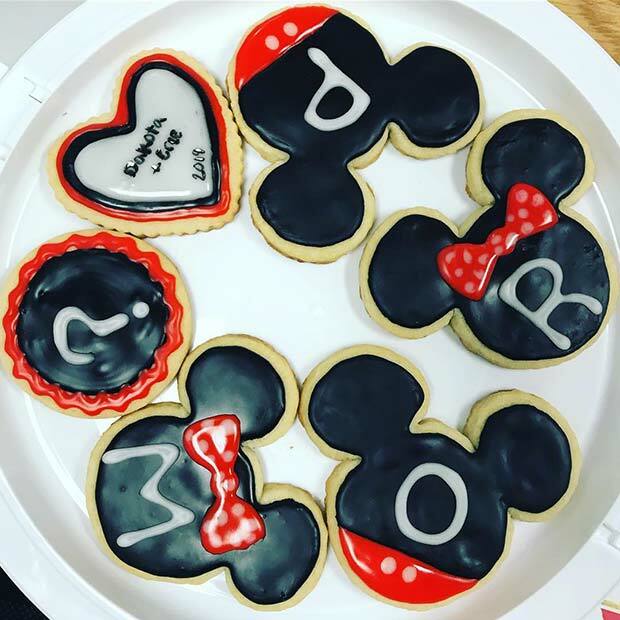 We love this idea because it is perfect for two people who have already been to one prom together. It is a nice way to look back on previous proms and look forward to future ones. 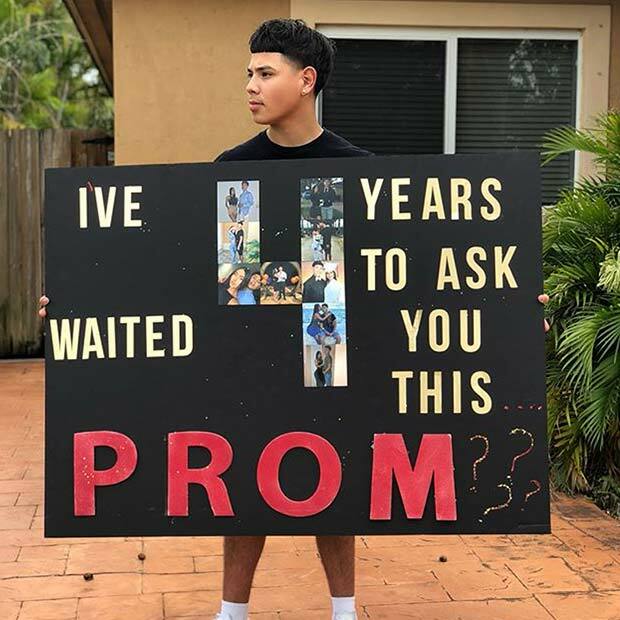 We hope you have found the perfect prom proposal idea!